Even though the craters were formed some 12,000 years ago, methane is still leaking profusely from the craters. Methane is a potent greenhouse gas, and of major concern in our warming climate. "The crater area was covered by a thick ice sheet during the last ice age, much as West Antarctica is today. As climate warmed, and the ice sheet collapsed, enormous amounts of methane were abruptly released. 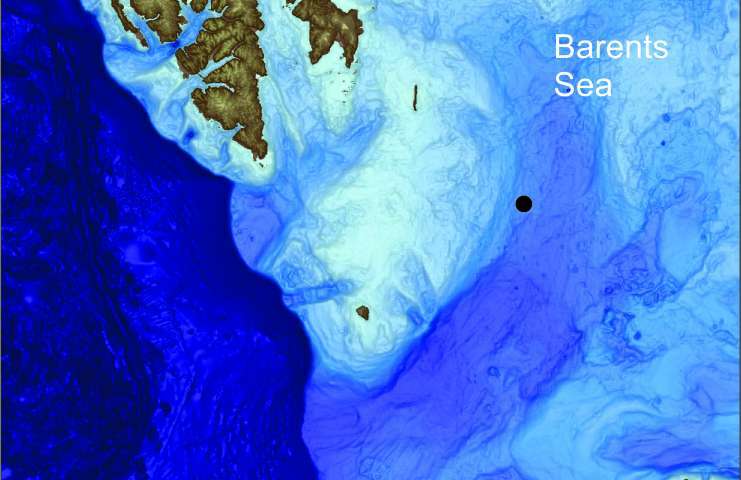 This created massive craters that are still actively seeping methane " says Karin Andreassen, first author of the study and professor at CAGE Centre for Arctic Gas Hydrate, Environment and Climate. Today more than 600 gas flares are identified in and around these craters, releasing the greenhouse gas steadily into the water column. "But that is nothing compared to the blow-outs of the greenhouse gas that followed the deglaciation. 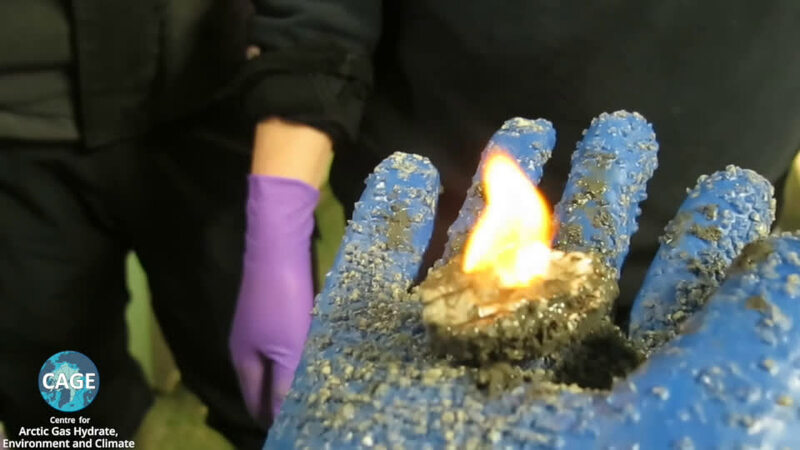 The amounts of methane that were released must have been quite impressive." "We have focused on craters that are 300 meters to 1 kilometre wide, and have mapped approximately 100 craters of this size in the area. But there are also many hundred smaller ones, less than 300 meters wide that is" says Andreassen. In comparison, the huge blow-out craters on land on the Siberian peninsulas Yamal and Gydan are 50-90 meters wide, but similar processes may have been involved in their formation. 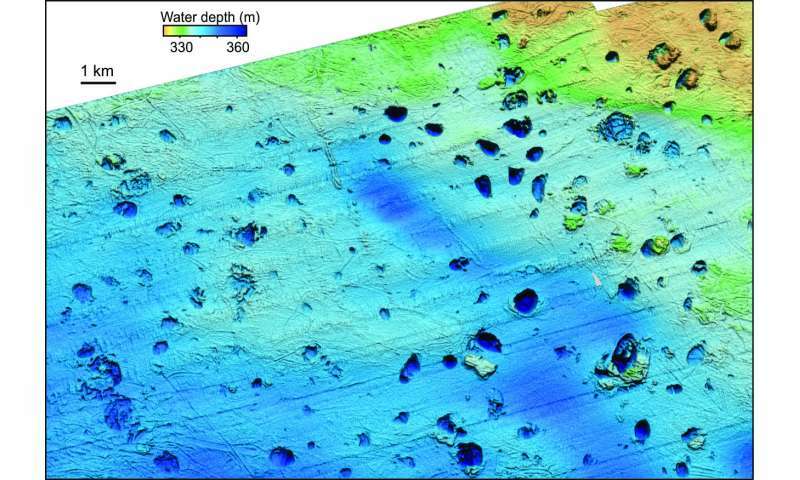 The Arctic ocean floor hosts vast amounts of methane trapped as hydrates, which are ice-like, solid mixtures of gas and water.These hydrates are stable under high pressure and cold temperatures. The ice sheet provides perfect conditions for subglacial gas hydrate formation, in the past as well as today. Some 2000 metres of ice loaded what now is ocean floor with heavy weight. 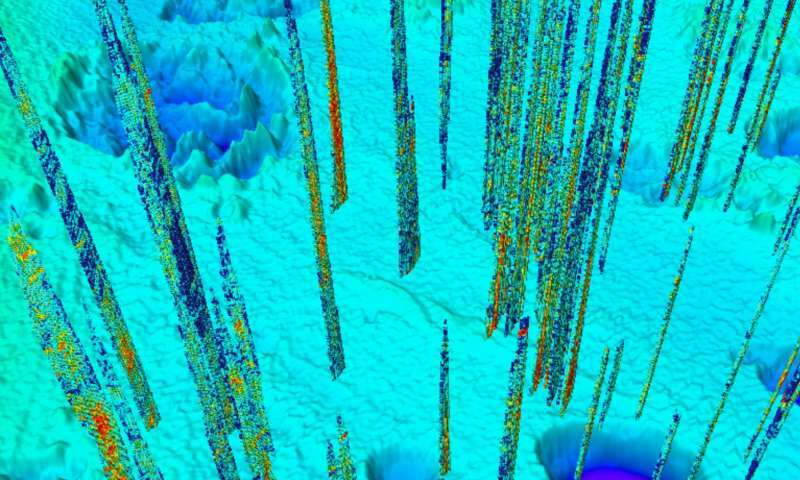 Under the ice, methane gas from deeper hydrocarbon reservoirs moved upward, but could not escape. It was stored as gas hydrate in the sediment, constantly fed by gas from below, creating over-pressured conditions. "As the ice sheet rapidly retreated, the hydrates concentrated in mounds, and eventually started to melt, expand and cause over-pressure. The principle is the same as in a pressure cooker: if you do not control the release of the pressure, it will continue to build up until there is a disaster in your kitchen. These mounds were over-pressured for thousands of years, and then the lid came off. They just collapsed releasing methane into the water column" says Andreassen. Major methane venting events such as this appear to be rare, and may therefore easily be overlooked. Another fact to consider is that there are reserves of hydrocarbons beneath the load of West Antarctica and Greenland ice sheets today. "Our study provides the scientific community with a good past analogue for what may happen to future methane releases in front of contemporary, retreating ice sheets" concludes Andreassen. Making sea floor craters Great Again. The clathrate gun conjecture gets a bit of a boost; this will also affect analysis of the beginning of the current interglacial. The planet sweats methane produced by subsurface microbes, a process not considered by the models. Until the level of methane inputs from subsurface sources can be accurately quantified, we can have no idea how much CO2 is being recycled by natural processes. Not knowing the true amount of the input, it is impossible to quantify the magnitude of the human contribution to global CO2 levels as a percentage of the whole. But the implication is that there are CO2 recycling mechanisms not yet accounted for. A corollary is that reducing human emissions will have less effect on global CO2 levels than current models suggest. Gee ma look, nobody died. Anonym, the planet has been both warmer and colder than today and that within historic times. The climate changes. The climate always changes. "The polar bears will be fine" -- Freeman Dyson.